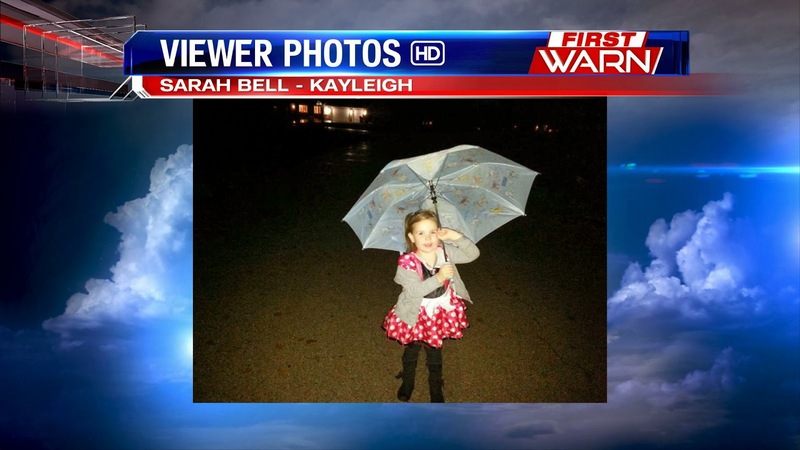 Despite the rain on Halloween, we received some great photos of the Stateline celebrating this spooky holiday. Check them out below and remember... you can send your own photos to weather@wtvo.com. Happy Halloween! The Stateline has seen a LOT of rain the last two days. Take a look at some of the rain totals coming in from Wednesday and Thursday. 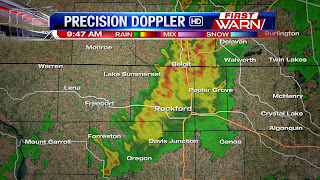 NWS: Morrison (Whiteside) - 1.45"
Paul Rimsa: Belvidere - 1.57"
Bob Ellison: Rockford - 1.75"
If you have any rain totals or other weather reports, we'd love to hear from you! You can e-mail us at weather@wtvo.com. The rain continues to fall this afternoon and with areas south of Rockford receiving over an inch from what came down Wednesday evening, two day rainfall totals will top two inches! Strong winds within the jet stream moving into western Illinois will help to sustain enough lift within the atmosphere to keep the rain going for the next several hours. At 1pm the cold front is just crossing over the Mississippi River and temperatures are beginning to drop behind the front with Galena now only at 48°. Ahead of the front temperatures remain in the low 60s. 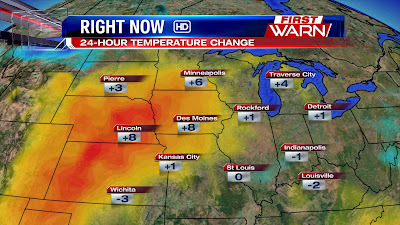 The cold front will reach Rockford between 3pm and 5pm with temperatures quickly falling once the front passes. The front is expected to clear the entire area after 8pm. Unfortunately, it does look like the steady rain will continue through at least 5pm/6pm. 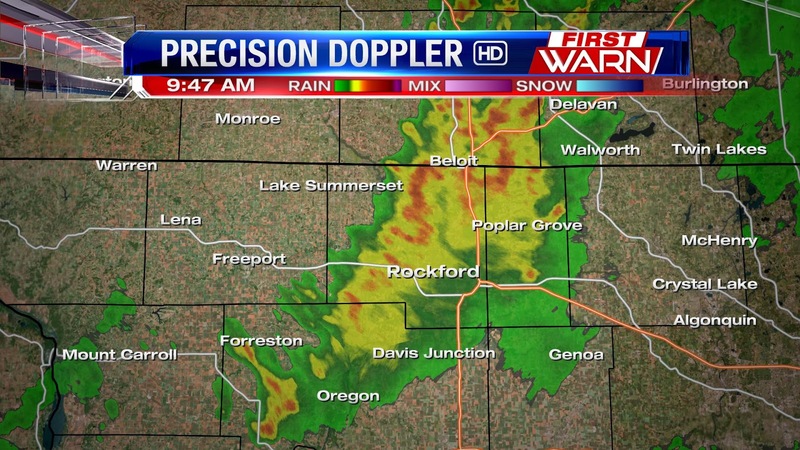 9:48am Radar Update: A band of heavier rain continues to moves through northern Illinois. Heavy downpours and reduced visibility can be expected as the rain moves through. Additional showers moving in towards the Quad Cities. Heavier rain Wednesday evening brought over an inch of rain for some cities in northern Illinois. Additional light showers will continue for the next hour or two with a brief break in the rain mid-morning. The break won't last, however, as the main system currently in the Oklahoma panhandle lifts northeast into Iowa by early afternoon. This will help with the redevelopment of rain and even thunderstorms later today. 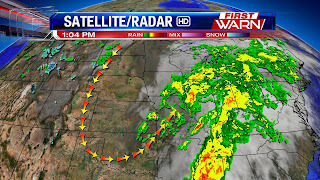 Rain in Missouri will move along the cold front later today with another inch or so of rain falling by tonight. Early this morning, the Stateline was dealing with cool, dry air at the surface. As some drizzle moved into the area, it evaporated, causing the surface humidity to start building. When the humidity finally hit 100% around 4:00 or 5:00 this morning, a LOT of fog formed. In the weather world, we call this evaporation (or frontal) fog. 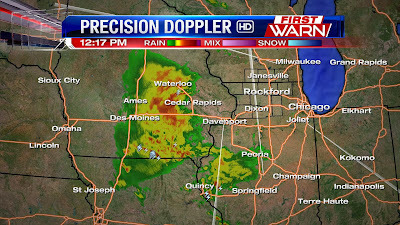 It's been an active weather day across the Stateline and with the threat of rain moving closer, we're only just beginning. As of noon, Green County in Wisconsin was the only part of the Stateline still under a Dense Fog Advisory, but visibilities are still limited areawide. Expect conditions to gradually improve through the afternoon. 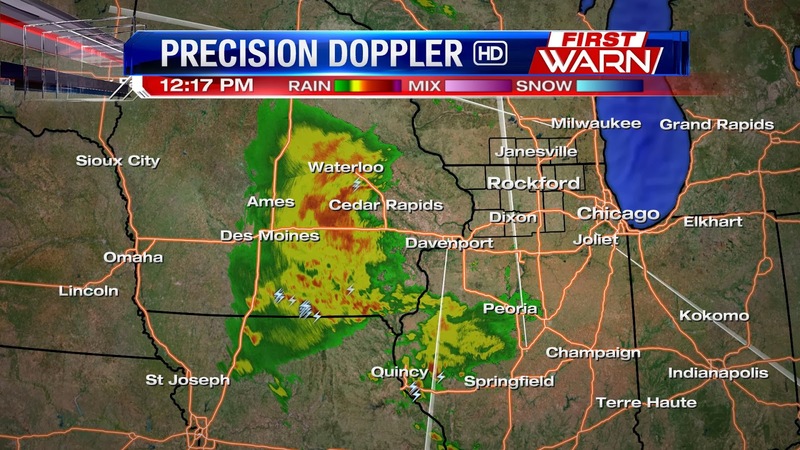 As for our showers and storms, everything is still in Iowa and central Illinois. Here's the current timeline for afternoon rain chances. The outlook for Thursday is unfortunately looking fairly damp. 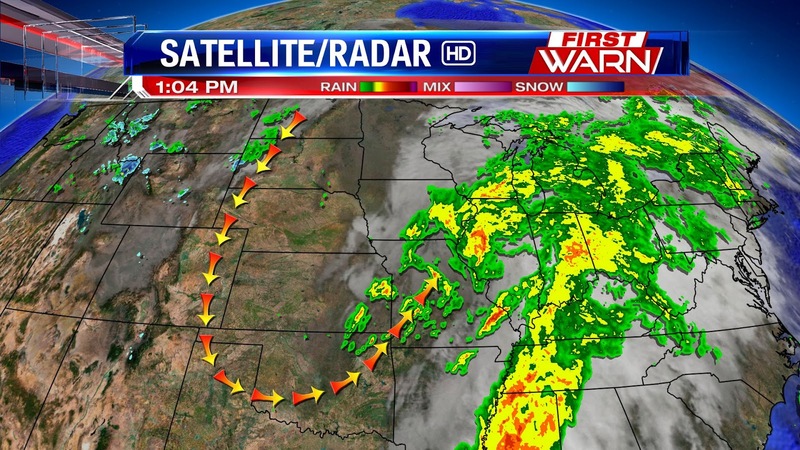 A very strong storm system moving east into the central Plains will help lift a warm front through the area this afternoon and evening. 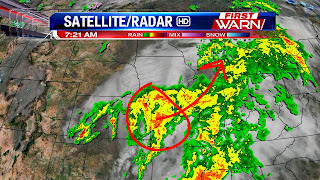 Moisture streaming in several thousand feet above has helped keep the fog in the place and the warm front will allow the surface moisture to increase and cause the showers and embedded thunderstorms in Iowa to expand further east this afternoon and evening. Showers and thunderstorms will become more numerous and widespread tonight with the enhancement of the low level jet and strong winds aloft. Thursday morning will start of rainy and stormy with a brief break possible mid to late morning. As the cold front approaches during the afternoon a second low pressure system developing along the front may help ignite additional showers and storms during the late afternoon and early evening. All the rainfall should end once the front passes late Thursday evening. 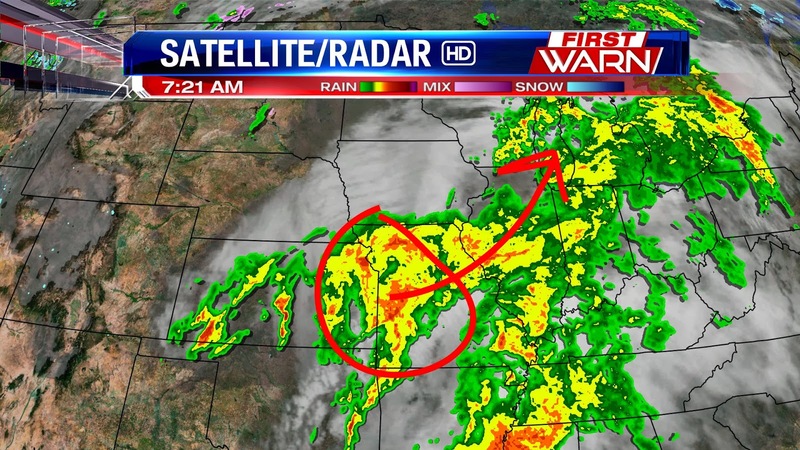 Areas that may be hit with the highest rainfall totals will be a line from Kenosha, Wisconsin southwest to Freeport and Savanna. There totals could exceed an inch. 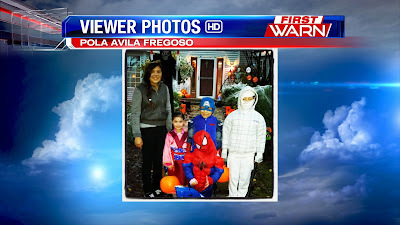 Earlier trick-or-treating hours may be a little more troublesome than the later hours. Update: Dense Fog Advisory now in effect for the entire Stateline area - southern Wisconsin and northern Illinois. A Dense Fog Advisory has been issued for Winnebago, Boone, Ogle, Lee and DeKalb counties until 11am this morning. Dense fog has developed across northern Illinois and southern Wisconsin with the visibility dropping to near zero in many locations. The fog will continue through mid-morning with the rain threat increasing through the afternoon and evening. 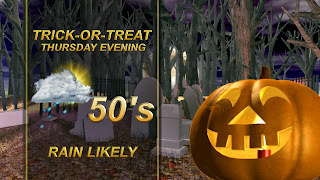 You don't usually think of thunderstorms in late October, but that's exactly what we're looking at as we inch closer to Halloween. These maps show the areas that have the best chances for thunderstorms on Wednesday and Thursday. 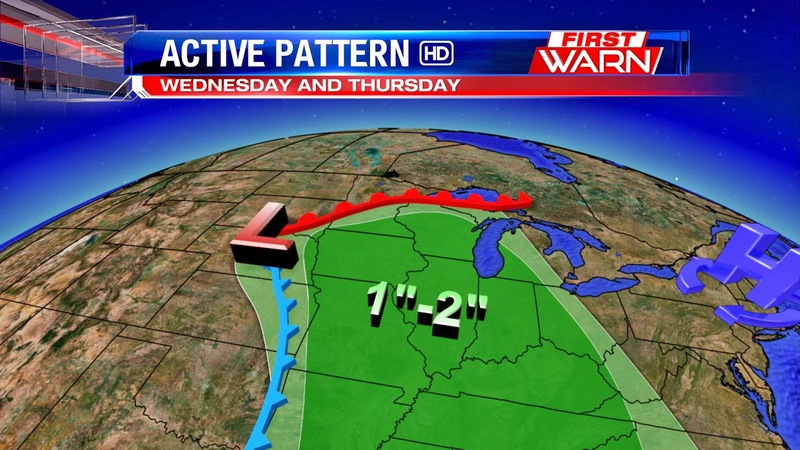 For the Stateline, our timeline for possible storms will be Wednesday night through Thursday afternoon. The most important forecast this week will be the one for Halloween. Right now it looks like we'll see a trick and a treat from Mother Nature. 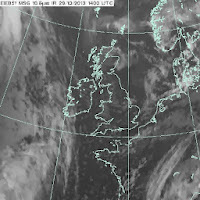 Sunday night the United Kingdom was hit with one of the worst storms since October of 1987 when the Great Storm hit. Wind speeds got as high as 70+ mph with heavy rain. Four people died in Britain by falling trees due to high winds. 600,000 homes are left without power. 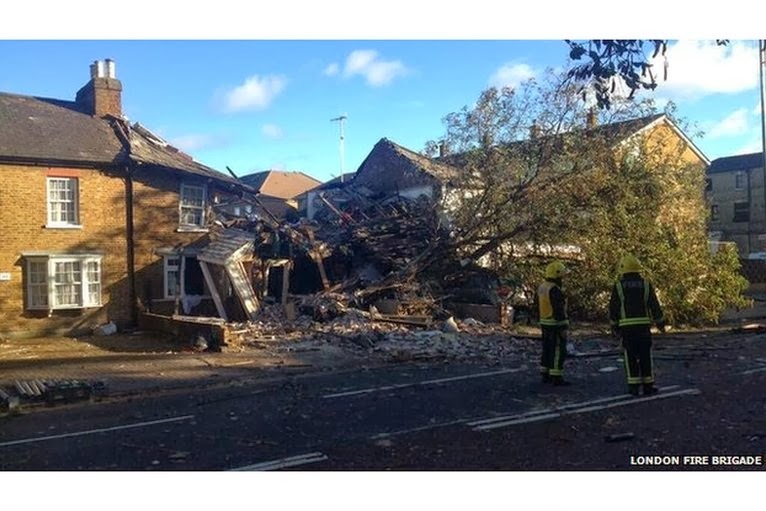 The picture on the left was an explosion that happened in Housnlow, west London caused by a tree that fell on a gas main, killing two people inside the house. Hey baseball fans! Hope you're ready for game 5 of the World Series, because the weather couldn't be much better for Monday night's game in St. Louis between the Red Sox and the Cardinals. Temperatures at first pitch (7:07pm CST) will be in the low 60s with partly cloudy skies and light easterly winds. Temps will only dip into the mid 50s by the end of the game. Today was our 11th straight day with below average temps, but that streak will come to an end as we approach Halloween. 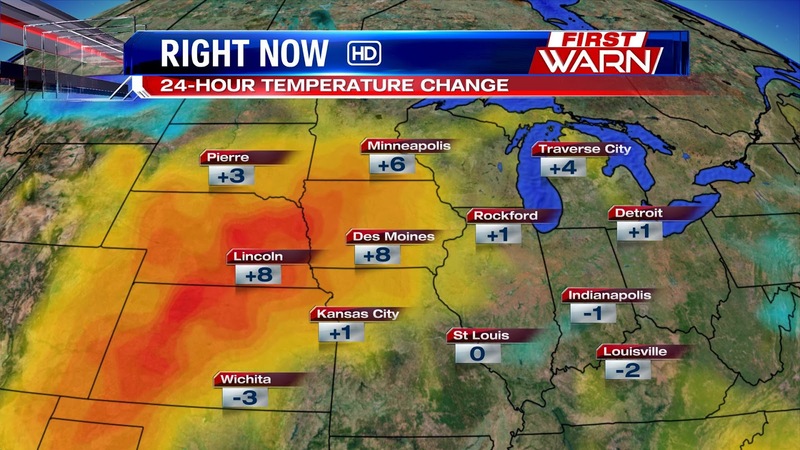 On Sunday night, temps over the Central Plains were nearly 10° warmer than the same time on Saturday. Since weather patterns move from west to east in our part of the world, we will be tapping into the warm up for the last week of October. 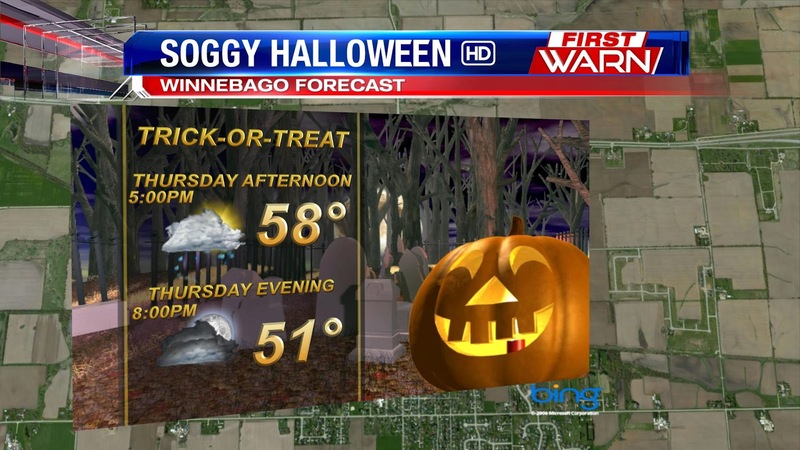 Mother Nature may be giving us more of a trick than treat on Halloween. 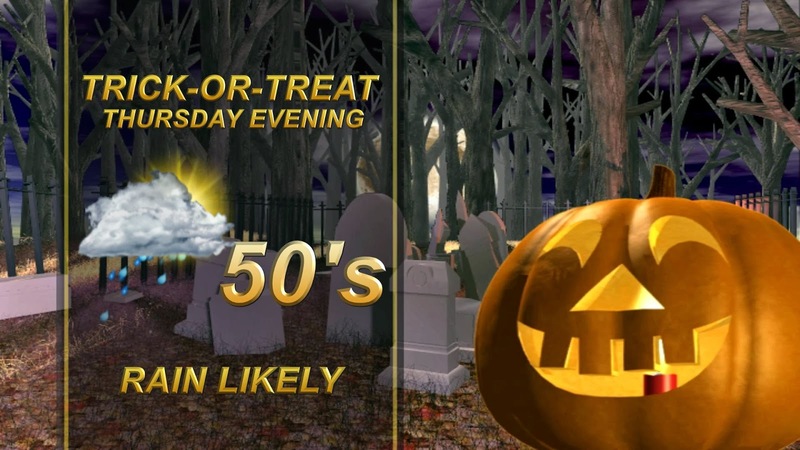 While some towns around the area will be holding their trick-or-treating hours early, most will celebrate on Thursday - and the forecast isn't looking all that great. Rain, possibly heavy, will be likely during the afternoon and evening ahead of a cold front Thursday. The front will be out of here early Friday morning taking the majority of rainfall with it, but not before dropping nearly an inch or two of rain. 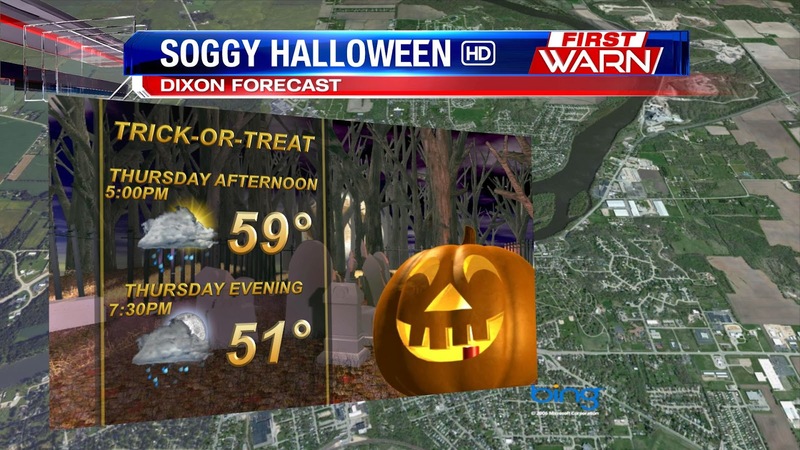 If you know of any Halloween festivities going on Sunday, I would suggest heading out to those. This way you can show off that cute Halloween costume and the kids can still get some candy. The remainder of the weekend will stay quiet. Temperatures will start off cool Sunday morning but a southwest wind will boost afternoon highs back into the low to middle 50s. Very strong high pressure will move into the Great Lakes Sunday night pushing a weak cold front through southern Wisconsin and northern Illinois Monday morning. Winds will turn more northeast Monday and Tuesday keeping temperatures a little cooler than Sunday's readings. 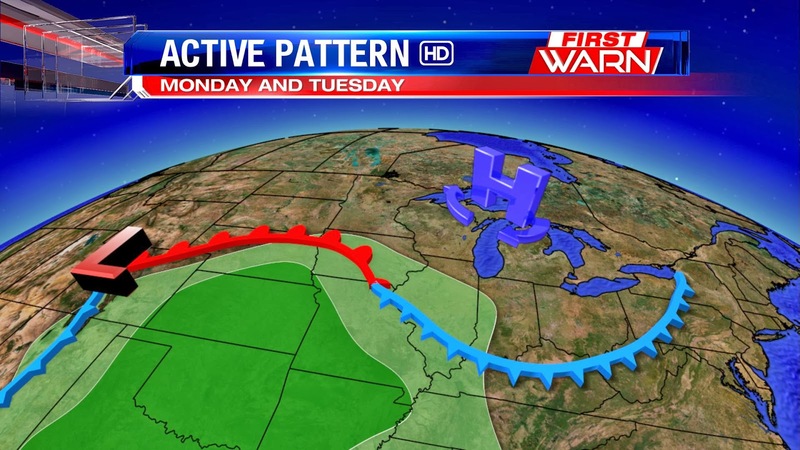 Meanwhile, low pressure will begin to develop in the central Plains pulling a warm front through Wednesday. A combination of southerly winds from high pressure and the low in the Plains will bring a decent amount of Gulf moisture northward Wednesday and Thursday. 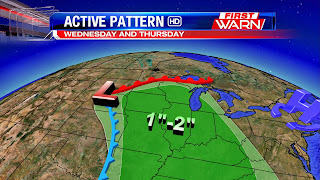 A few upper level disturbances riding along the warm front could cause a couple light showers Tuesday, but the biggest threat for rain will arrive late Wednesday and Thursday. Rainfall amounts of 1"-2" could be possible by the time the system moves into the Northeast Friday afternoon. Unfortunately, it does look like Halloween will be rainy, and possibly stormy, if enough instability develops in the atmosphere. With the weekend forecast looking a lot more conducive to outdoor plans, this might be one of your last chances to catch the Stateline's changing fall colors. It looks as though this week's winter-like weather has put many areas in northern Illinois past their peak for fall colors. Southern Wisconsin, however, is currently in its peak for fall foliage. Our recommendation? Head north this weekend and enjoy the view! KICKOFF: Partly cloudy and breezy. Temps in the mid 40s. HALFTIME: Partly cloudy and breezy. Temps in the low to mid 40s. END OF GAME: Partly cloudy and breezy. Temps in the low 40s. When do the first snowflakes usually fly? 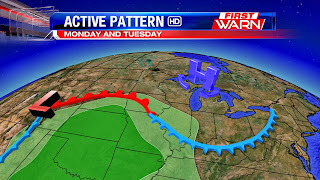 Why the Cool & Active Weather Pattern? How Chilly Will October Get? Could Northern Lights Be Visible Thursday?